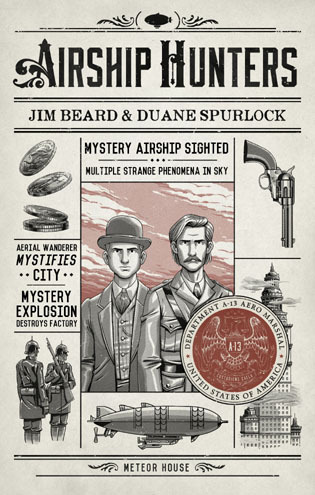 Meteor House » Announcing Airship Hunters by Jim Beard & Duane Spurlock! Announcing Airship Hunters by Jim Beard & Duane Spurlock! Meteor House is extremely pleased to announce the publication of a brand new novel by Jim Beard & Duane Spurlock! Does Airship Hunters get to the bottom of the nearly forgotten mystery of 19th-century UFOs? As with Meteor House’s original novellas, Airship Hunters will be published as a Signed Limited Edition trade paperback. And just like with our novellas, your name will appear on the acknowledgments page in the same order you preorder—as long as you preorder by July 1st 2015. As always, the print run will be determined by the number of preorders received. Not many copies beyond those reserved will be printed, another reason to get your order in today! Comments Off on Announcing Airship Hunters by Jim Beard & Duane Spurlock!